A Rashtriya Swayamsevak Sangh- (RSS) backed centre is bringing a menu of natural cosmetics and medicinal products to Amazon. The centre, Deen Dayal Dham that’s backed by the RSS in Mathura is bringing consumers products like cow-dung soap and other items suffused with cow urine, Modi and Yogi kurtas and more. Initially, Deen Dayal Dham will sell around 30 personal care and therapeutic products online. It will also sell the digestive, Kamdhenu Ark, as well as apparel. Arun Kumar, RSS spokesperson said that the Dham sells personal and medicinal products of over Rs 1 lakh and Rs 3 lakh worth of apparel every year. Kumar said that the purpose of selling the products online is to generate employment for locals and make them financially independent. If the online endeavour is a success then production and jobs will increase. Manish Gupta, Deputy Secretary of the Dham told Times of India that products of their Kamdhenu line that have cow urine as its primary ingredient, as well as kurtas and khadi products will be on offer on Amazon. Other products, besides the Kamdhenu Ark that is made from cow urine and aniseed or saunf, includes shampoos, face packs, toothpaste, Ghanvati which is a tonic containing pepper, Kamdhenu Madhunashak Chur for diabetes and obesity and Shoolhar oil for sprains and arthritis. Gupta clarified that cow urine and dung are the bases for the soaps, face packs and incense sticks and no synthetic ingredients are used. With as few as 10 workers and as many as 90 calves, the Dham’s Deen Dayal Kamdhenu Gaushala Pharmacy that makes these products, works on a small scale at present. Although most of the products are only sold at RSS camps or the Dham, they are sold out much before the end of the year, as mentioned in the daily. The Dham expects the demand for these products to increase. All of the Dham’s products are priced between Rs 10 and Rs 230. 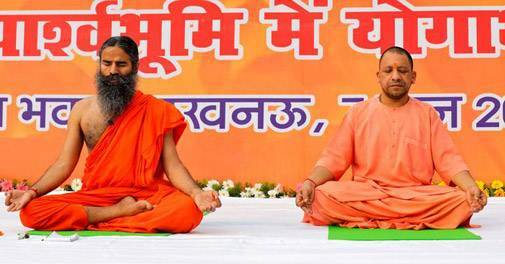 The Modi and Yogi kurtas are priced at Rs 220 apiece. While the Yogi kurtas are available in saffron colour only, Modi kurtas are available in different colours and are longer than the Yogi ones. These kurtas, along with jackets, pyjamas and white shirts are made by the tailoring centre, an operation with 50 workers, mostly women who make Rs 120 per day. However, the Dham is not the only manufacturer to offer cow urine and cow dung items. Baba Ramdev’s Patanjali Ayurved offers multiple products including Godhan Ark, Sanjivani Vati, Panchgavya Soap, Kayakalp Oil and Shudhi Phenyl that contain cow urine.